Rational Pastime: World Series Expectancy Stats Raise Question: Were the Mets Ever Really in It? World Series Expectancy Stats Raise Question: Were the Mets Ever Really in It? Dave Studeman calls Win Probability Added (WPA) the "ultimate story stat." WPA uses Tom Tango's win expectancy tables to measure a team's probability of victory (ergo, win expectancy) following every play. 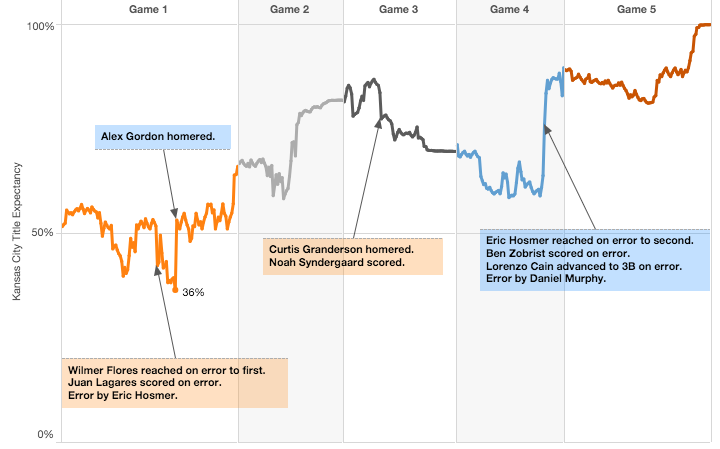 From these data, we can interpret several different characteristics of the game, including how close it was, how exciting it was and what the biggest plays of the game were. We can also take each change in win expectancy, credit it to the pitcher and batter (or baserunner) involved in the play, and measure their contributions by the sum of all those credits. That's what WPA is. By combining FanGraphs' WPA numbers and my World Series projections, I aim to depict and uncover the stories of the 2015 World Series in the same way. How close was it, really? What were the biggest plays? Who was on the mound, in the batter's box and on the base path when the biggest plays happened, and what does the sum of the swings in win expectancy say about who the biggest contributors were? You can read my answers to these questions below, and answer your own questions by using the interactive 2015 World Series Win Expectancy chart. 1. Were the Mets ever really "in it?" Though the popular narrative was all about how close the series was, how close New York Mets were to "getting back in it," I'm no longer sure that story is accurate. 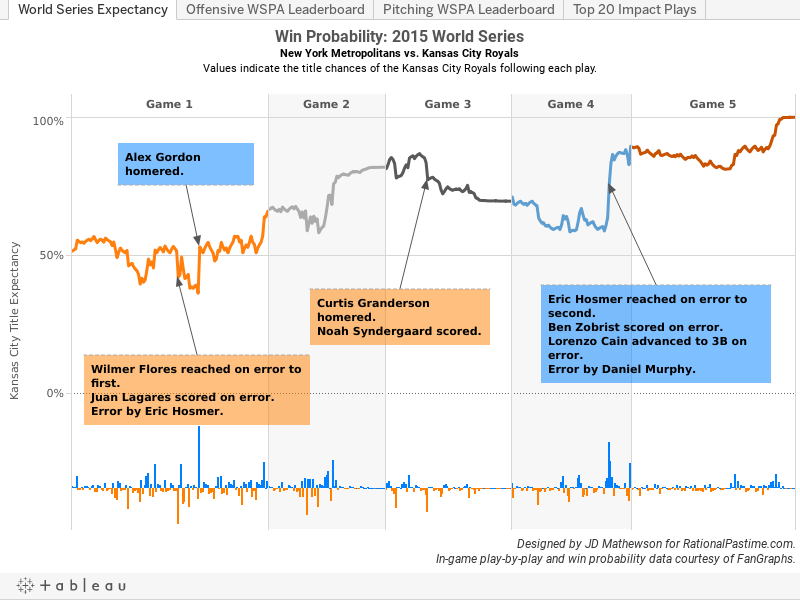 The Mets' World Series expectancy peaked in game one at 64%, right before Alex Gordon hit the home run that set the stage for the Kansas City Royals' victory in extra innings. The Mets completed only two additional plays as the series favorites: a Juan Lagares single in the 11th inning of that same game and a sacrifice bunt that advanced him to second. Even after the Mets took the lead and looked as if they were going to even the series at home in game four, their peak title expectancy was 41% (following Michael Conforto's second home run). Compare these peaks to the last two world series losers: the 2014 Kansas City Royals at 82% and the 2013 St. Louis Cardinals at 74%. The Mets never came close to scaling either peak. I'm not sure the 2015 World Series was as close as it seemed at the time. 2. Alex Gordon's homer was the biggest play of the series. Poor Jeurys Familia: only the most committed, cerebral Mets fans will remember him for his fantastic regular season and NL postseason performances instead of his meltdowns in the 2015 Fall Classic. One of those meltdowns was precipitated by Alex Gordon's game-tying home run, which forced game one into extras and led to an eventual Kansas City victory. Before the play, the Mets were 64% favorites to win the series. Afterwards, the Royals were 53% favorites. That swing is good for a World Series Probability Added (WSPA) of 17%. 3. The second and third biggest plays of the series both involved errors, Eric Hosmer. The second biggest play, and perhaps the most memorable play of the 2015 World Series, was the game-four Daniel Murphy error that allowed Eric Hosmer to reach and facilitated Lorenzo Cain's mad-but-successful dash for home. The error erased the Mets lead and marked the end of New York's last real shot at the title (see note #1). The play was good for a WSPA of 12%. The third biggest play was Eric Hosmer's game-one error allowing Wilmer Flores to reach and Juan Lagares to score, temporarily putting the Mets ahead in the opener. This play represented a swing of 9%. 4. No single player stands out as most valuable. In 2013 and 2014, it was obvious who deserved the MVP award. David Ortiz rose above his fellow Red Sox to claim the award, followed by Madison Bumgarner's dominant performance last year. The 2013 and 2014 World Series Expectancy charts bear this out. In 2015, however, no single player stood out in terms of World Series Probability Added. Fittingly, the top three WSPA leaders are all Royals: Gordon sits atop the leaderboard at 18%, followed by Ben Zobrist and Hosmer at 17% (the best Mets contributors were Curtis Granderson and Jon Niese at 12%). None of those players won World Series MVP. Instead, the honor went to Salvador Perez, whose WSPA was actually... fourth from last at -6%?? 5. Wait, did you say Jon Niese was one of the Mets' best performers? 6. Picking the "LVP" isn't any easier. According to WSPA, there is a Least Valuable Player standout, and it's not Murphy; it's Familia. Despite Murphy's two big World Series errors, the WSPA accounting method dings the Mets closer with over a quarter (26%) of the responsibility for New York's title defeat. Daniel Murphy's WSPA, however, is positive at 3%. Breaking that down, he produced .09 WSPA on positive plays and -.06 WSPA on negative plays. "But wait," you demand, "didn't you just say his game-four error responsible for -.12 WSPA?" Yes, it was, but the way that FanGraphs calculates WPA, it debits those numbers from Familia, not Murphy. Since I'm working with FanGraphs numbers, those are the numbers that count here. However, even if I were to credit Familia back that full 12% and debit it from Murphy, Familia would still be stuck with a -14% WSPA and Murph with a -9% impact on the Mets' title chances. In the end, it looks like Familia really was the Mets' weakest link. 7. We can't lean too heavily on those WSPA numbers. As tempting as it is to use World Series Probability Added as a tool to determine the most valuable contributors, we shouldn't rely on it too heavily. Both WPA and WSPA are highly dependent on the context in which plays occur. A home run in a tie game in the ninth has a lot more impact than the same home run by the same player in a seven run game in the fourth. Similarly, plays that occur when the series is still close have a much bigger impact than plays that occur when it's all but decided. Problem is, pitchers, batters and base runners have very little influence over the context in which they perform. This is especially true at the series level, when no individual player has any measurable influence on how close the series is when he steps into the batter's box or onto the mound. Therefore, it's not fair to credit (or debit) them for the full effect that their play has on their team's title chances. If you want a better measure that still relies on win probability, go to FanGraphs and add each player's WPA/LI totals from each game of the World Series. So why do I even bother talking WSPA? Because sometimes it raises questions that nobody else asked even if it doesn't have the right answer, and because sometimes it adds more information to the already dominant narrative, and because I simply find it interesting. And that concludes Rational Pastime's coverage of the 2015 MLB Postseason. Thanks to those of you who followed along from the start and to those who just dropped by in the end. It's been a fun ride. But... just because the Mets never regained 50%+ favorite status subsequent to Gordon's homer in Game 1, does not mean that they were never close to "getting back in it." After Clippard retired Escobar to lead off the 8th in Game 4, the Mets had a 41% of winning the series. 41% is pretty substantial. Yes, the series would end roughly 24 hours later, but at that point, the series was basically a toss-up (KC's slight edge was mostly due to home-field). Also, for what it's worth, I don't think I've yet heard any Mets fan blame Familia, at all, for anything. (And Mets fans are not the type to hesitate to place blame - nor are they uniformly, ahem, cerebral.) To anyone who followed the team throughout the year, Familia's value to the team was very clear; and to anyone who followed the World Series, his lack of culpability was also very clear. I freely admit that the headline is a hook to grab readers. Mea culpa. As for Familia, I hope he's remembered for his regular season, NLDS and NLCS, and not his World Series. But as for culpability? I'm not sure it's clear as you think it is. He shat the bed when it was time to lock things down. He had a terrible WS no matter how you look at it, and his failures hurt the team more than any other player's.